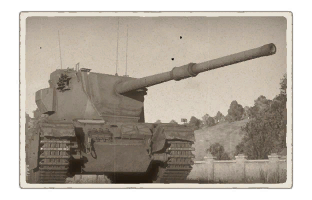 The FV4004 Conway is a Rank V British tank destroyer with a battle rating of 7.0 (AB/RB/SB). The tank destroyer was released with Update 1.57 "Battle March". It is armed with a cannon developed to take on the heavy Soviet IS-3 tank. It excels in fighting the top-rank heavies. This tank plays very similarly to the KV-2. It lacks armor on all sides and has a very large caliber gun, able to penetrate everything it faces, severely damaging most. It can be played as a usual tank destroyer, excelling at it with its high velocity APDS rounds, sniping from a distance. Extraordinarily, it is also able to take a heavy tank in a 1v1 as well. 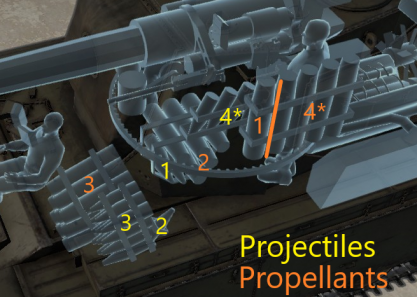 Turret sides are angled, causing inaccurate shots to bounce. Ammo racks of the Conway. As a tank destroyer, you might want to go for heavy tank hunt. In this case, you should check the battle rating of opposing team. Despite having heavy gun, your best bet in uptier would be long range flank sniping. This is due to APDS doing less damage to crew and components, the thicker the armor it penetrated was, thus doing minimal damage through heavy tank's frontal armour. As such, you are less dangerous to superheavy tanks (especially the ones from 8.0) from front, compared to FV 4005, which many players will mistake you for. You still can penetrate most of breakthrough tanks, forcing them to retreat or slip up at critical moment. Since APDS is super high velocity, you can snipe across the map with little issue, and do fatal damage from sides. To everything else you are extremely dangerous, and, if detected, have some presence factor. This can be beneficial and bad at same time, since you can scare off heavy tanks and attract medium and light tanks, and even other SPG's. Your turret might hold off a few stray shots from distant or weak opponents, but your hull is still quite fragile, and reload times are still too long, so there is no room for mistakes at close range duels. For these reasons, if possible, adversaries must be kept away from you, so their guns are inadequate at fighting you, your hull must be kept hidden, and enemy SPG and "sniper" oriented medium tanks must be neutralized on sight. In case if light vehicle is stalking you, sometimes it's better to just load HESH, provoke, then hopefully blast enemy away. Heavily armoured vehicles are still more vulnerable to APDS, than HESH, regardless of range, unless you hit them at specific weakspots with it. The first upgrades to head for is Parts and FPE for increased survivability. Once you got these two, everything is good, but get the rangefinder for enhanced RB or SB gameplay. It is also important to get Fire adjustment and Elevation gear upgrades, since they reduce probability of a miss. Very powerful 120 mm gun. Gun mantlet has decent armour. Fairly low speed for a lightly armoured vehicle. Only carries a maximum of 20 shells. When the Centurion tanks entered service in British service in 1945, the British didn't tank account to the sudden appearance of the Soviet IS-3. The IS-3 tank showed the Western Allies needed to reconsider their tank inventories, which at the time the IS-3 was introduced only composed of mostly M4 Shermans, M26 Pershings, and the Centurions. The British, recognizing the need of a bigger gun to fight the IS-3, started production on Conqueror tank. However, development takes time and the Conqueror would not be ready until 1955. 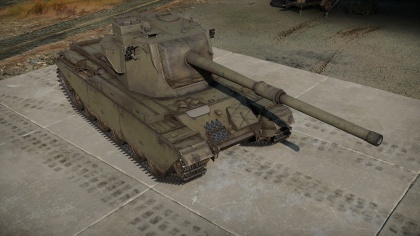 As an interim project until it is done, the British took a Centurion Mk 3 tank and upgraded with a new turret made from rolled plate that can mount the 120 mm L1 gun, the same gun meant for the Conqueror. This vehicle, designated the FV4004 Conway was to have the heavy armament, yet the same maneuverability as the base Centurion. One of such vehicle was made in this matter before the whole thing was cancelled in 1951. The sole piece made is now stored in the Bovington Tank Museum. Another attempt at this kind of mounting with the Centurion was the FV4005, which was meant to be a tank destroyer with a larger 183 mm gun. The project started in 1951 and developed in July 1955. The gun was mounted in a similar fashion as the Conway on a lightly armoured turret. This was a limited production and by August 1957, the whole project was disassembled. The FV4005 also has survived in the Bovington Tank Museum. Skin and Camouflages for the Conway in Warthunder Live. This page was last edited on 5 April 2019, at 01:20.